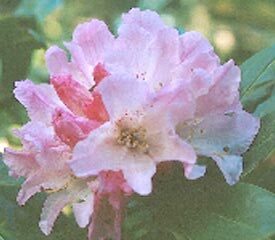 Flower/Truss Description: Funnel-campanulate, white to rose, often flushed pink, spotted crimson. Truss holds 10-20 flowers. Foliage Description: Leaves elliptic to broadly ovate-lanceolate, up to 5" long, with whitish indumentum turning red-brown and splitting into patches at maturity. Plant Habit: Compact, rounded shrub.